Taïwain is becoming more and more of a tourist destination; many travellers end up extending their stay after the welcome surprise they encounter upon arrival. Taipei, the capital, is a bustling modern metropolis full of beautiful architecture and interesting night markets. 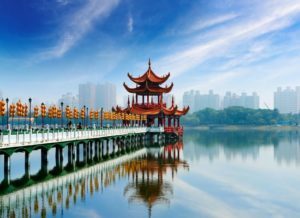 Take the time to explore Kaohsiung, a stunning city where you will be able to find the beautiful Lotus Lake and the celebrated Confucius Temple. Nearby, hikers will have the chance to walk the trails and to admire the incredible waterfalls. With its warm and comfortable climate, spending hours at the seaside bathing or swimming in the warm crystalline water will be time well spent. You do not need to worry about treatment in Taiwan, as the doctors are well trained and the medical system is adequate. You are recommended to use the International Priority Care Center and the Cathay General Hospital in order to receive medical care. You can experience fine quality treatment from the National University Hospital of Taiwan. There are plenty of pharmacies in Taiwan with well-trained pharmacists who can provide you with great advice. Most of the medical personnel in Taiwan have completed their training in the United States and speak good English. In order to seek emergency assistance, call 119. Rest assured that paramedics are well trained and have all the necessary medical equipment for emergency medical situations. Is Taiwan Safe for Travel? Only a passport is required to enter Taiwan for trips under 90 days. Your passport must be valid for at least 6 months beyond the date of departure.